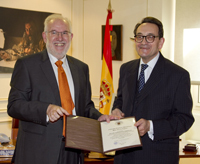 While Fernández-Armesto is best known as an historian, he is also an accomplished journalist whose work appears frequently in the national press in Spain and the U.K. Since that first paper, Fernández-Armesto has made his mark in a wide variety of subjects—publishing books that include 1492: The Year the World Began, Columbus on Himself, Millennium: A History of the Last 1,000 Years, So You Think You’re Human: A Brief History of Humankind, Near a Thousand Tables: A History of Food, and Ideas That Changed the World. His research and teaching interests include Spanish history and the history of late medieval and early modern colonial societies, particularly cartography, maritime subjects, exploration, and cultural exchanges. In recent years, he has made contributions to global history, understood as the study of genuinely global experiences, and to global environmental history.